Have you ever seen or wondered why the color of meat may vary? Beef (and most meats) is naturally a bright, cherry red color. When an animal is harvested (slaughtered) for meat, energy in the form of ATP (Adenosine triphosphate) is needed. The ATP breaks down glycogen (which is the source of carbohydrate energy for the muscles) through postmortem glycolysis, which produces lactic acid. Lactic acid builds up in the muscle over a 16 to 24 hour post-harvest time frame. A normal level of lactic acid in the muscle will cause the meat to be bright cherry red (pH of 5.6) when it is exposed to oxygen for a short period of time. 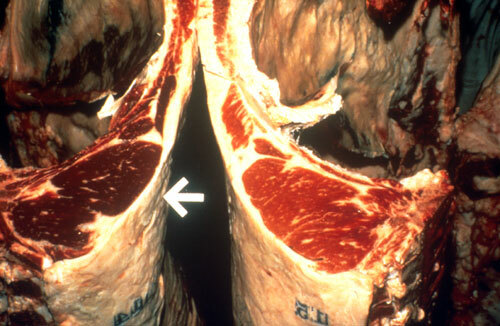 In dark cutting beef, the animal has undergone extreme stress or excitement before it is harvested. Some beef breeds are predisposed to be more excitable than others, and calm, low-stress handling is very important with these cattle. High stress events may include, but are not limited to: handling, transportation, weather extremes, or anything that would make the animal draw on glycogen reserves before it is harvested. When the available glycogen is used up, the limited amount available is converted to lactic acid, the muscle pH will be 6.0 or higher, and the color of the meat will be darker than normal. The color can range from dark red to nearly black in color! Dark cutting beef can also be firm and dry appearing, and is commonly referred to as Dark, Firm, and Dry (DFD). Dark cutting occurs in less than 5% of all carcasses (and carcasses will receive a discount at the packing plant), and is usually higher in the fall and winter months as temperature fluctuations are more common. Dark cutting beef is safe to consume and generally has no palatability problems. It is generally used in the food-service industry rather in the retail industry. Meat of this color is not aesthetically pleasing to consumers, additionally it has a shortened shelf-life, and poor storage properties. The carcass on the left is a dark cutter, while the carcass on the right would be considered the bright, cherry red of a normal carcass. Source: UNL Quality Assurance.